The 1970s saw the rise of influential Aboriginal organizations with diverse mandates and ways of operating. This emergence of powerful voices had its roots deep in the past, in a time before traditional Aboriginal political structures were disrupted and suppressed with the coming of the fur trade. This Aboriginal revival created organizations, representing the Dene, Métis and Inuvialuit people of the Northwest Territories, that took many forms from political to cultural and spiritual. Some of these groups included the Indian Brotherhood of the NWT, the Métis Nation, and the Committee for Original Peoples Entitlement (COPE). Although these groups often worked independently, they were all part of voicing concerns, and establishing the rights of Aboriginal people in the NWT and in Canada. 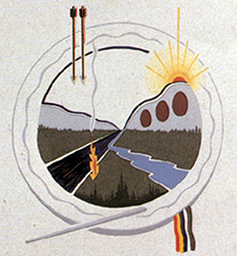 The Dene Nation logo tells the story of Yamoria, a great man who taught the Dene how to live and govern wisely. Dene and Inuvialuit peoples in the NWT began to form powerful political organizations in order to reclaim their right to govern their own land.